I've been hearing raves about the buffet at Mandarin Oriental'sMelt - The World Cafe restaurant. With the on-going UOB promotion on 3 diners + 1 diner free, my colleagues and I decided to go and discover what the buzz was all about on this famous restaurant. Armed with an adventurous and curious appetite, we lavishly feasted on the extensive repertoire of combined asian and international buffet. A wide array of fresh seafood on ice was the star of the buffet set-up. It's beaming with fresh oysters, crabs, lobsters, scallops, mussels and prawns. This was a very good station to start with. This year's Chirstmas brought so much difference into our lives. It's a far cry from how we usually celebrate it. Read this previous post why it's so. Anyhow, celebrating it (sans the traditions we were born to) is still a must thus, the customary christmas decoration at home. The party season has officially started. How many parties have you been into lately? 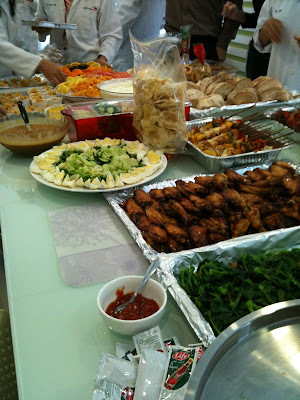 As for me, I've been to an office potluck party just recently and boy, was I fully stuffed with sinfully delicious home made goodies that can be translated into a parade of international cuisines! Mainly attributed to the multiracial ambiance at work, we feasted on different cuisines from different countries. The experience was actually more than just a delight to the palate. It's beyond sharing different cultures through food. Here are some of the foods that we had. I wish I could have taken better, more stunning shots as well as the rest of the items we had, but I was too busy digging into each of them that I can hardly contain my enthusiasm in trying all the dishes. Besides, I only had my ever reliable iPhone camera at hand. I'm so looking forward to post with my food shots taken through my new EOS. That'll be the bigger "facelift" happening on this blog soon! !